Water is the most essential nutrient for sustaining life, as it hydrates, transports oxygen and other nutrients into cells, regulates body temperature, prevents constipation and cushions joints. Your body requires 8 to 12 cups of water daily to replenish the fluids lost through perspiration, urination, bowel elimination and breathing, reports Clemson Cooperative Extension. But, water may not provide a palatable taste to everyone. Healthy alternatives to water can hydrate your body while offering more appealing flavors and textures. Coconut water derives from the inside of green coconuts, and is packaged in a juice-box as a healthful beverage. 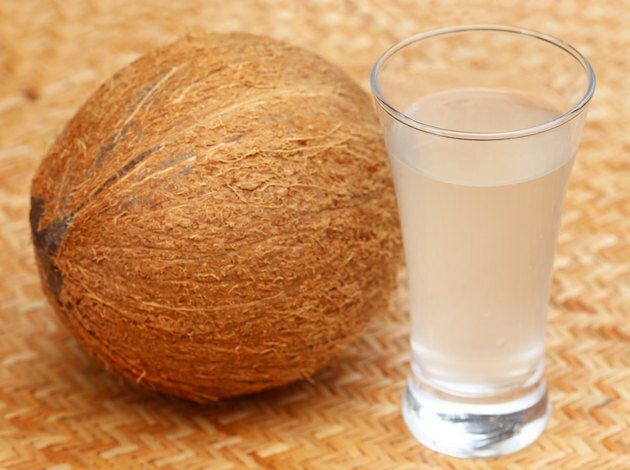 An 8-ounce serving of coconut water straight from the shell provides significant quantities of electrolytes, including 250 milligrams of sodium, 45 milligrams of phosphorus, 600 milligrams of potassium and 60 milligrams of magnesium. But, packaged coconut water tends to contain significantly less sodium, ranging from approximately 14 to 29 milligrams. Additionally, this beverage includes only 46 calories and 9 grams of carbohydrates per 8-ounce serving, reports Jennifer Koslo, a registered dietitian at Kaplan University. Coconut water hydrates the body while providing other beneficial nutrients, such as vitamins, antioxidants and amino acids. Tea is a healthy alternative to water with a few drawbacks. Tea comes in a variety of natural flavors to appease your palette. This calorie-free beverage contains antioxidants, agents that combat free radicals in your body. Antioxidants in tea boost immune function, neutralize cancer cells, decrease bad cholesterol levels and prevent the formation of blood clots. But, tannins, a type of antioxidant present in teas, may prevent the absorption of calcium in the food you consume with your tea, reports Brown University. Furthermore, some teas contain significant amounts of caffeine. Caffeine acts as a diuretic, which may promote dehydration. Decaffeinated teas are available to assist in hydrating your body. Limit or forego adding sugar or flavoring to your tea, as this will increase the calorie content. Infused water, also known as spa water, consists of water with added fruits, herbs or vegetables. You can purchase spa water at your local grocery store, but some brands contain added sugar or sugar substitutes. Infusing your own spa water at home with limes, lemons, oranges, cucumbers, mint or ginger provides a healthy alternative to plain water. These herbs can enhance a pitcher of cold water with natural flavors and add antioxidants to your beverage. Low-sodium chicken or vegetable broth is a savory alternative to water. This low-sugar substitute contains only 38 calories and 72 milligrams of sodium per 1-cup serving of chicken broth. It also includes important minerals, such as magnesium, phosphorus, potassium and calcium, and 4.8 grams of protein. Add scallions or mushrooms to provide texture to this hydrating soup. Watermelon quenches your thirst and assists in replenishing your body fluids. Ninety-two percent of watermelon is water, reports Julie Garden-Robinson, Food and Nutrition Specialist at North Dakota State University Extension Service. But, watermelon provides texture, flavor and vitamins, such as vitamin A, vitamin C and thiamine, not naturally found in drinking water. Additionally, this thirst-quenching fruit includes powerful antioxidants, such as lycopene and beta-carotene, that help combat free radicals. You can eat watermelon in slices or balls or liquefy it for a refreshing beverage. Kaplan University: Coconut Water: Is It Really “Nature’s Sports Drink”? North Dakota State University Extension Service: Prairie Fare: How about Some Watermelon?